Synth supergroup Node are returning after a 17-year hiatus to perform a gig that will see them using "the largest collection of vintage analogue synthesizer equipment ever seen outside a recording studio" at the Royal College of Music in London. 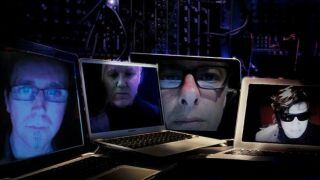 The band, which features producer Flood, producer and musician Ed Buller, film composer Mel Wesson and synth guru Professor Dave Bessell, will be performing their ambient soundscapes on Friday 27 February. We're promised that all the synths will be played live, in real time, though computers will also be involved in some capacity. The live rig, which features synths from the likes of Roland, Moog and Korg and is valued at more than £500,000, will be transported to the venue in four vans and is said to weigh 15 tonnes. Commenting on the reunion, Flood said: "Node is not about analogue or digital; man or machine; old school or new school but about expressing emotions by human interaction. We are not an app!" Tickets for the event are priced at £30 and available from the Royal College of Music website.